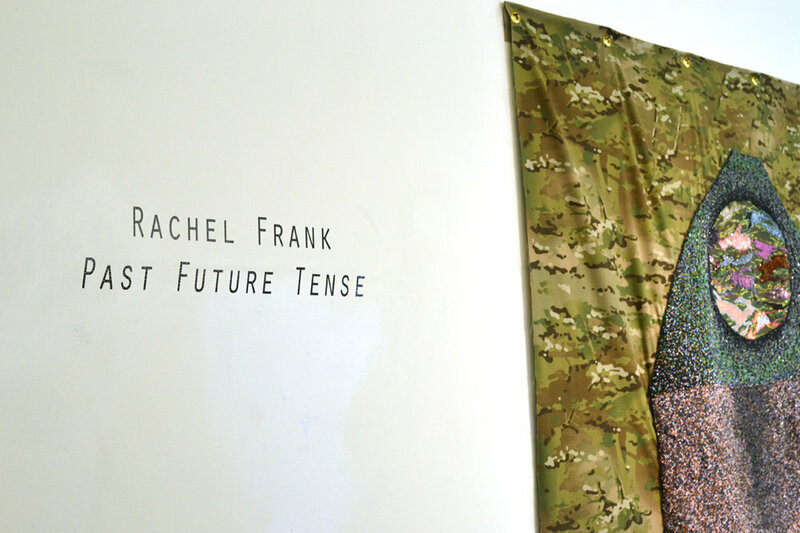 Jacob Rhodes, Director of Field Projects, is pleased to present PAST FUTURE TENSE, a solo show by Rachel Frank that explores the socio-political and Anthropogenic shifts brought about by human activity, highlighting our relationships to vanishing ecosystems, life forms, and modes of dwelling. Building on Rachel Frank’s ongoing series on environmentally-themed projects, PAST FUTURE TENSE examines the growing tensions between the natural world and the manmade, the animal and the political, and the past and the present in the age of the Anthropocene. The Anthropocene is the new term for the epoch in which we are presently living, a period in which the geologic and environmental processes of the earth itself are being profoundly altered by human activity. Frank’s works challenge us to think our place, and our responsibility, within these epochal shifts, transitions, and upheavals in our common landscape. This is clearly both an environmental and political question as Frank asks her audience to rethink the anthropocentric presuppositions grounding our egotistical relationships to the environment and also our mastery of knowledge and fixity of place. 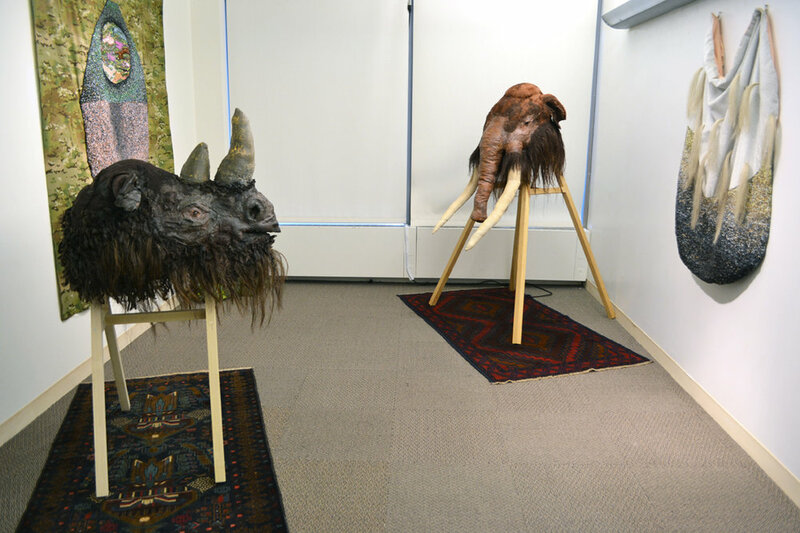 PAST FUTURE TENSE features sculptures of a disembodied woolly mammoth and woolly rhinoceros: two animals from the last wave of extinctions of Megafauna at the end of the Ice Age, who serve both as mirrors into the past and reminders of the crisis facing related species today. These long-past creatures install themselves in Frank’s work as physical, grotesquely oversized objects, returnees of the real—extinct and therefore impossible—who nonetheless inhabit the space gazing back at the audience. 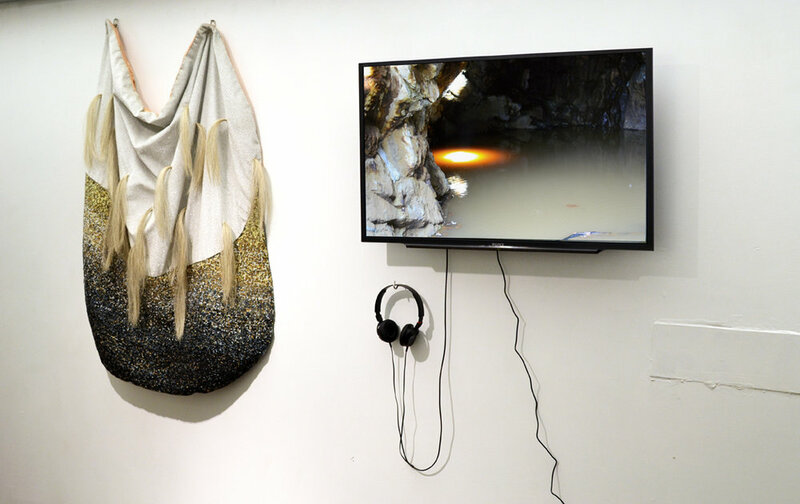 In her video, Vapors, performers wearing the woolly rhinoceros and a woolly mammoth masks will appear in the forests, former mining caves, and ruins of our contemporary landscape, carrying out a philosophical dialogue that connects the figure of the ruin to environmental issues and, more broadly, man’s relationship with nature. Through a split-screen, the creatures uncannily mirror each other in out of synch movements, sharing both their displacement from their proper epoch and their isolation as the last of their kind. Each speaks in a computerized voice, suggesting contemporary Delphic oracles: no longer conduits of the gods, they do not give fateful directions but, having seen all through the passage of time, instead poetically wander, commenting on the debris that constitute progress. With the emergence of tent cities and displacement of individuals due to economic forces, environmental changes, or regional conflicts, shelter is vital. Responding to these Anthropocentric conditions, a pair of panels from Frank’s Pattern for a Yurt series hang on adjacent walls. As pattern pieces to be assembled, they offer the possibility of a nomadic structure that is both protective and potentially transformative. Historically, the yurt has served as both a functional nomadic dwelling and a symbolic bridge between the cosmos and human beings: a physical guide on how to interact with the unknown. Large in scale, the panels provide enclosure using reflective glass beads. Yet they also serve as thresholds: like Alice’s step through the mirror, they open onto another space and another logic, where one’s dwelling in the cosmos is transformed and grounded during an unknown future. Born and raised in Kentucky, Rachel Frank received her BFA from The Kansas City Art Institute and her MFA from The University of Pennsylvania. 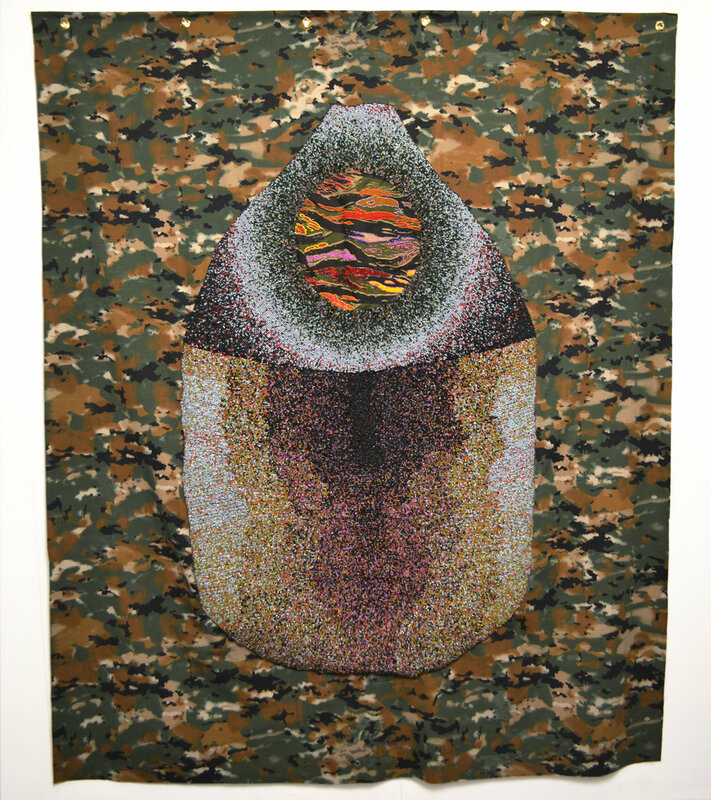 Frank is the recipient of numerous awards, including grants from The Pollock-Krasner Foundation, The Elizabeth Greenshields Foundation, The Puffin Foundation, and The Franklin Furnace Archive. She has attended residencies at Yaddo, The Marie Walsh Sharpe Foundation, Sculpture Space, The Women’s Studio Workshop, and The Skowhegan School of Painting and Sculpture. Her performance pieces have been shown at HERE, Socrates Sculpture Park, The Select Fair, and the Bushwick Starr in New York City and The Marran Theater at Lesley University in Cambridge, Massachusetts. She most recently participated in an artist residency at the Innoko National Wildlife Refuge in Alaska where a population of Wood Bison was reintroduced in 2015. Currently, she lives and works in Brooklyn, New York. 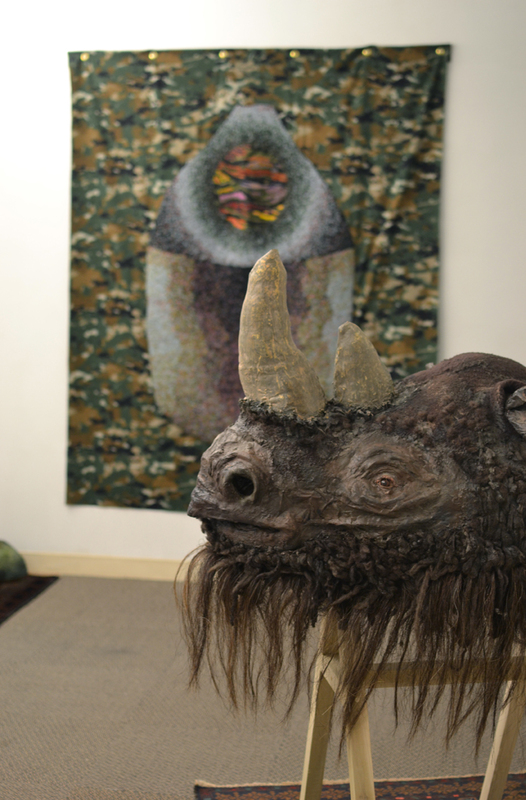 Pattern for a Yurt III, 2016, Fabric, thread, glass beads, and grommets, 76 x 64"
Coelodonta antiquitatis, Pleistocene Era Woolly Rhinoceros, 2015, Fabric, thread, wool, horsehair, and other materials, 25 x 33 x 28"
Ice Age Era Landscape I, 2016, Fabric, thread, glass mirror, acrylic, and other materials, 10 x 24 x 28"